Meet Tom and Arnisteen Clark, a Georgia couple who've been married for 68 years. When the two went to the Piedmont Fayette Hospital together, they were placed in separate rooms -- making this the second time the Clarks have been separated during their marriage. The first was when Army veteran Tom was stationed in Korea. However, the hospital staff on the orthopedic floor, where both Tom and Arnisteen stayed, helped Tom, who's 96 years old, visit his wife. 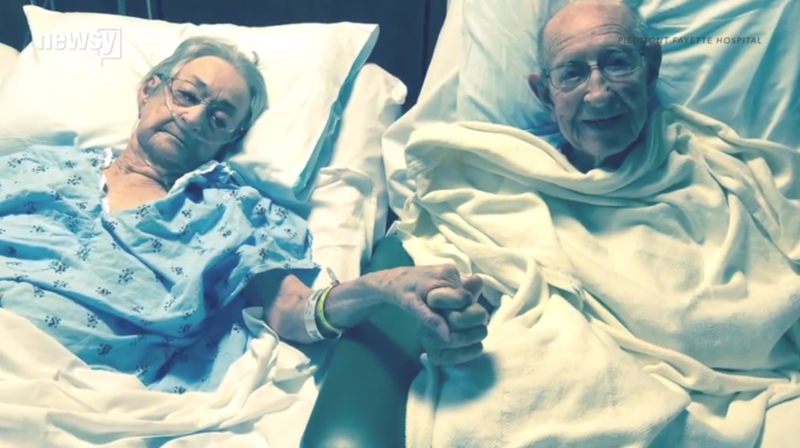 The hospital wrote on its Facebook page Tom was overcome with joy, saying, "I just can't stay away from her, she's the finest woman in the world." The hospital's post received more than 11,000 likes, but many are wondering why the Clarks weren't put in the same room to begin with. Hospital staff responded, saying, "All rooms on the fourth floor are designed to be private rooms. It is against state regulations to put two patients in a room designed to be a private room." A communications specialist for Piedmont Fayette Hospital told USA Today that as of Monday, the Clarks had been discharged from the hospital.